High short, knitted sweater 'Amplify'. Round rolled neck with ribbed trim. Flared, navy blue main body with marled blue/green insets at and under arms. gathered frill at hem in blue with raw edged seam. 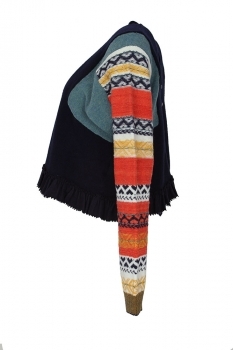 Multi-coloured and patterned sleeves, with mustard and blue ribbed cuffs. At the rear there are 9 buttons and a metal High stud at the bottom of the buttons. 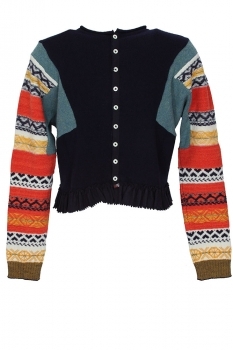 A really beautiful piece of knitwear.